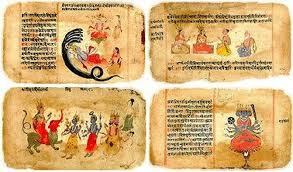 The Vedas teach equality among the people in society. No one is superior or no one is inferior. We findSamaanatha in the Vedas. Among these men there are no superiors or no inferiors, no middle ones either. They become great from small beginnings. They make progress in different ways by dint of their merits. By birth they are all highborn because they are all children of Mother-Earth. O you men of the Lord Refulgent! be available to us in a loveable manner or grow into praise-worthy souls in fair ways. These men are without superiors and without inferiors. They are mutually brothers. They march onwards for prosperity. The eternally youthful, the soul protecting, grief alleviating God is their father. The richly feeding Mother-Earth produces happy days to these mortals. Oh Almighty and Adorable God ! In the whole universe Thou dost the work of harmonizing and uniting, and most fully reveal Thyself in the world. We therefore, beseech Thee to bestow upon us in every way all the means that will enable us to live in peace and harmony. God says :- Let all your activities be so directed as to lead you to one common goal (for which) let there be conferences held among you in a common language. Let all of your minds be one for according to acquire knowledge of the various lore’s. In short do as the enlightened before you in all ages did, performing their tasks in life in cooperation and harmony, with minds in full agreement for the acquisition of knowledge. Like the ancient seers also, Worship alone, Who, the only real object of your devotion. Let your object in life be one and the same, your hearts equal (in feeling) and your minds in full agreement so that an excellent common status of life be achieved for all. Oh men ! I ordain for your concord of heart, unanimity of mind and freedom from hatred in dealings with each other. Love one another in every way even as the inviolable her new-born calf. O you men! may your water reservoirs be common; may the shares of food be enjoyed jointly. I unite you all under the yoke of common code of conduct with one another. Worship the Lord of Lustre congregationally, just as the spokes touch the hub from all sides. I enjoin on all of you to be mutually helping one another, to be united in your mind and to have one goal in life. You should, like the wise of all ages, ever cherish the idea of the liberation of your souls from the trammels of the world and to this end may peace of mind increase among you evening and morning. May your thoughts and hymns be common; may your assembly be common; may your austere vow, spiritual resolve be common; may all your minds be alike and united. I provide you with common food, drink and needs of life. All of you strive for a common objective. Let your bodies (or learning and other attainments) and minds work together in harmony for the achievement of the common ideal. It is for this that the Majestic God, the Protector of the universe, has brought you together in life. Needs to be put into practice.